In a highly competitive and complex marketplace, distributors, retailers and customers rule: Marketing high-quality goods at the lowest possible cost is your top priority. Make sure the furnitures you deliver make it to customers in mint condition with Northrich's cost-effective protective packaging solutions. 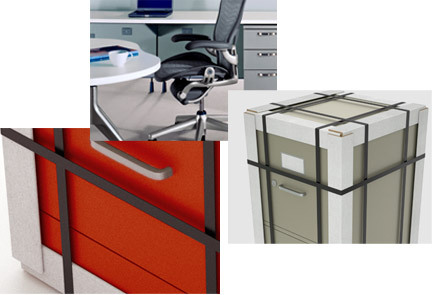 ANGLEGUARDTM and top and bottom cover guards are great for safeguarding office furniture, home furniture, bookcases and cabinets. ANGLEGUARDTM is fully recyclable, very durable EDGE PROTECTORS and used for contour furniture, providing precision protection and minimizing damage. When the ANGLEGUARDTM is used with other packaging material like stretch wrap, it provides a convenient packaging solution that minimizes damage. It is display-friendly because the customer can see the item and confirm the product's condition. It is a cost-effective packaging solution. Top and bottom cover guards ease the furniture load and palletized load and maximize storage space. They also reduce the need for wood pallets and may provide a 100% recyclable packaging solution. Prevent table top and table leg damage with the ANGLEGUARDTM edge protector, while substantially reducing replacement cost.